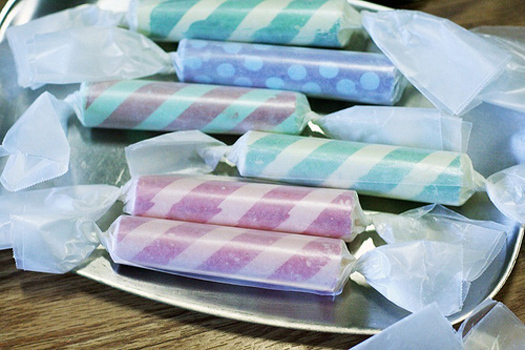 Wrap It Up: Mighty Girl simply wrapped these colorful sticks of chalk in wax paper, twisted the ends to seal and offered them as favors for her son's birthday. 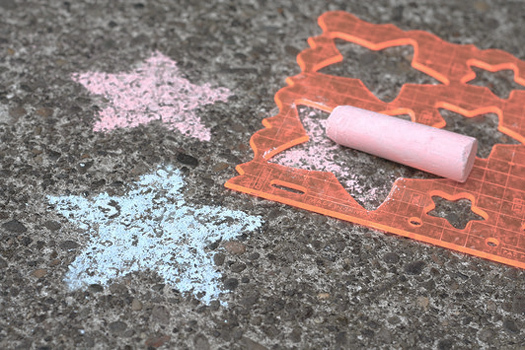 Stencil your sidewalk: Fiskars suggests using stencils to create chalk art designs, leading guests up to your front door. 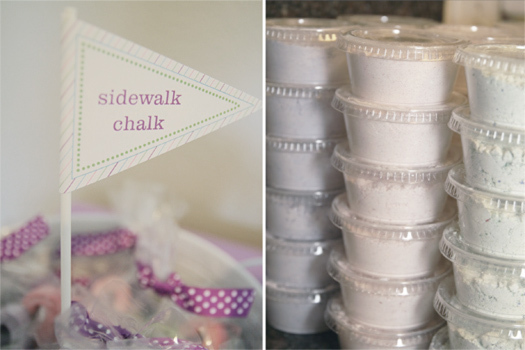 DiY: Paperbox Press offers 2 ways to make your own sidewalk chalk. In a large bowl, I mixed cornstarch + powdered tempera paint. You can add as much or as little tempera as you like, but note that the color will darken quite a bit when water is added and it's actually ready to use! I used small containers and put 3 (1 of each color) into each favor box. I tied a paint brush to the top, tied it up with some ribbon, and added a cute label! 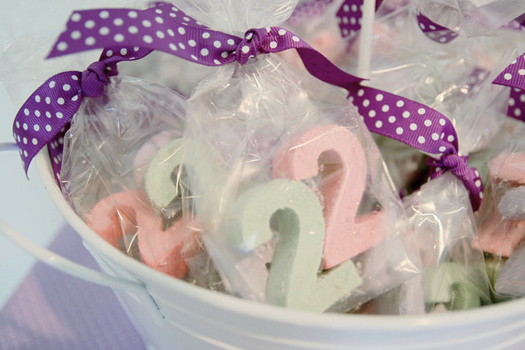 These are great summer party favors. Mix together 1 cup of Plaster of Paris with 1 cup of water. Add color to your mixture using powdered tempera paint. Blend well and let stand for a few minutes. Pour your mixture into the silicone molds. Set aside and let dry completely. Once dry you can remove your chalk from the mold. Set it aside to dry for approximately 24 hours more. I purchased the silicone molds from Sillycone and they have a variety of shapes to choose from. Love the chalks wrapped up like little candies. Too cute!! I love this!! Such a cute idea. XO! So cute! I love this D.I.Y! Cute idea! I have actually been using chalkboard spraypaint to make cute picture frames, wine bottles and other party favors. I usually tie pieces of chalk on to the gift but this would be nice too! I've seen homemade sidewalk chalk before, but never as beautifully presented as this! Love it! These are ideas are adorable. Thanks for sharing. I used your sidewalk chalk recipe and it was awesome ... I'll be posting it later this week and I'll link back to you.